FOREIGNER, the band behind classic and iconic songs like “I Want To Know What Love Is”, “Cold As Ice”, “Hot Blooded” and “Juke Box Hero”, is turning 40 this year and they’re bringing their friends along for the year-long celebration. First up is a mammoth worldwide tour, set to launch in Syracuse, NY on July 11th. For the US shows presented by Live Nation, FOREIGNER will be alongside Rock & Roll Hall Of Famers CHEAP TRICK - who are also celebrating 40 years since the release of their self-titled debut album - and special guest Jason Bonham who will be bringing the music of LED ZEPPELIN to great night of rock ’n’ roll. Tickets go on sale January 13th at livenation.com. “I never could have imagined when I set out to create FOREIGNER forty years ago, that we’d still be touring around the world and performing the music we love all these years later,” says founding member and lead guitarist Mick Jones. “I can’t express the gratitude I feel when fans share stories of how our songs have been woven into their milestones and memories over the years. This summer we are going to celebrate these songs, and I can’t imagine a better group of friends to share this monumental tour with, than CHEAP TRICK and Jason Bonham who are sure to make it a true tribute to the everlasting power of rock and roll." Inducted into the Rock & Roll Hall of Fame in 2016, CHEAP TRICK is undoubtedly one of the most influential classic rock groups of the past 50 years. They have performed over 5,000 shows spanning four decades and have sold 20 million records worldwide. CHEAP TRICK formed in 1974 and while they have evolved throughout the years, the band continues to reach mainstream and critical success. Hits such as "I Want You To Want Me”, “Dream Police" and "Surrender" have cemented the group as one of America's top rock 'n' roll bands of all time. In 2016, CHEAP TRICK released its 17th studio collection, Bang Zoom Crazy…Hello. 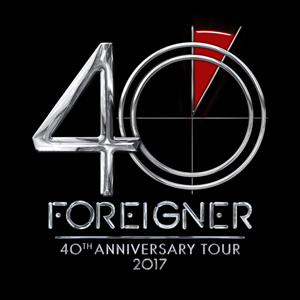 To coincide with the tour, FOREIGNER - Mick Jones (lead guitar), Kelly Hansen (lead vocals), Jeff Pilson (bass, vocals), Tom Gimbel (rhythm guitar, sax, vocals), Michael Bluestein (keyboards), Bruce Watson (guitar) and Chris Frazier (drums) - will be releasing a celebratory 40th anniversary album that features forty FOREIGNER tracks throughout the years entitled 40 - Forty Hits From Forty Years (Rhino). This album is a comprehensive compilation of original hits and several tracks from the current lineup with Kelly Hansen on vocals including “Cant Slow Down”, “Too Late” and the Top 20 AC hit “When It Comes To Love”. The album also features two new songs, and “Give My Life For Love”, a brand new song by Jones. Rhino is kicking off a year-long catalog promotion with the January 24th picture disc release of Head Games. Since the 1977 release of their first hit “Feels Like The First Time” and their self-titled debut album on Atlantic Records, FOREIGNER has been universally hailed as one of the world’s most popular rock acts with 10 multi-platinum albums, 16 Top 30 hits, and worldwide album sales exceeding 75 million. Responsible for some of rock and roll’s most enduring anthems including “Juke Box Hero,” “Cold as Ice”, “Feels Like The First Time”, “Urgent”, “Head Games”, “Say You Will”, “Dirty White Boy”, “Long, Long Way From Home”, and the worldwide #1 hit, “I Want To Know What Love Is”, FOREIGNER continues to rock the charts more than thirty years into the game. Check out the tour at any of the following stops, with more dates to be announced in the coming weeks and posted on the band’s official website.